This Carpeteria Genie sells flooring in Las Vegas! In 1960, Harold and Ted Haserjian founded a carpet business in Santa Clarita called Carpeteria. They grew their carpet empire to over twenty five stores along with over forty franchises in both California and Nevada! And they did it all with their awesome mascot, the Carpet Genie! Evoking images of magical flying carpets, the Carpeteria Genie was a twenty foot tall genie, looking like he came right out of a magical lamp ready to grant wishes to the carpet buyers entering the store below his feet. 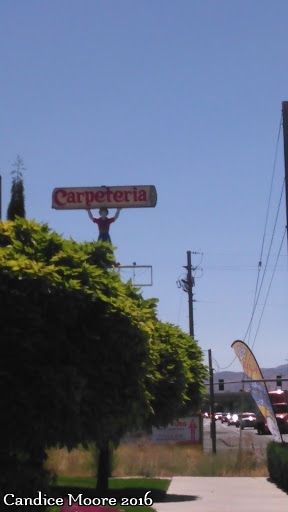 He stood on top of the stores, wearing a turban and holding up the Carpeteria sign, which was in the shape of a giant carpet. The Genie saw all as he was double sided, literally two faced, looking in both directions. Yes, he watched you driving up to him, and then after passing him in your car, if you looked back, he was looking at you again! Their mouths appear to have come in two varieties, one with a tooth filled grin and the other with a non tooth filled mouth that's much more lip. The corporation lasted almost forty years before declaring bankruptcy in 1999. Although some of the franchises remain, there are sadly very few of the giant genies still out there. Where once there were several carpet genies including ones in Long Beach, Concord, Bakersfield, and Downey, now there are perhaps five remaining. One is in California located in North Hollywood, while two remain in Nevada located in Las Vegas and Reno. The Reno Genie is slightly different and smaller than the original Carpeteria Genie. The Reno location opened in 1980 and is actually still a Carpeteria. Lastly, at least one genie, possibly two, reside at the American Sign Museum in Cincinnati, Ohio. The North Hollywood Carpeteria Genie is located on Laurel Canyon Boulevard and until recently was still standing over a carpet store called L&S Carpet. In 2017, however, Superior Tile moved in, and repainted the genie orange and black. The Genie was badly in need of a paint job. The Las Vegas Genie has recently been restored, complete with new paint. It is located on West Charleston Boulevard and is presiding over a wholesale flooring store.